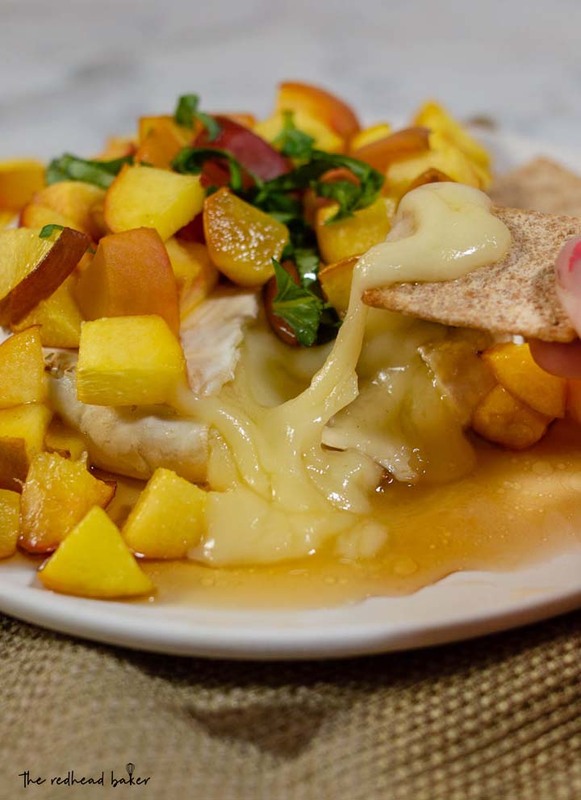 Think baked brie is only for winter holidays? Think again! Honey, basil and peach baked brie uses the freshest flavors of the summer to complement the buttery cheese. Today is one of my favorite food “holidays” — National Cheese Day! I love cheese. Hard cheese, soft cheese. Cheesy dishes like mac and cheese, pizza, and grilled cheese. So, to celebrate National Cheese Day, I made one of my favorite appetizers: baked brie. No, it’s not just a winter holiday appetizer! 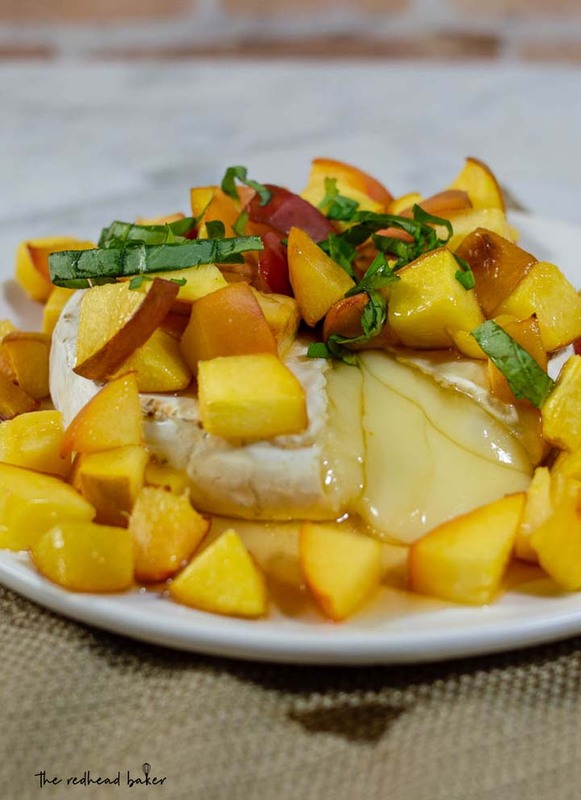 This baked brie is topped with some delicious summer flavor. It’s also a really easy appetizer to make. Chop some peaches, chiffonade some basil, and that’s it for prep work! If you’re unfamiliar with chiffonade, it’s pretty easy. Pick some basil leaves from the stem. Pile them up, then taking one side-edge, roll them into a log. Then, use a chef’s knife to cut the log cross-wise into thin strips. You should be able to find a wheel of brie in the specialty cheese area (near the charcuterie meats) in your local grocery store. Otherwise, look for a cheese shop in your area. The parchment paper isn’t required, but it does make clean-up a LOT easier. You just need to take care to trim away any excess that sticks up higher than the top of the pan, because when you go to broil the brie, you don’t want the paper to be too close to the flame. I served this with whole wheat crackers, and it was incredibly delicious. Peach and basil is a great sweet-and-savory combination. This is my idea of a perfect summer appetizer! Preheat the oven to 350 degrees. 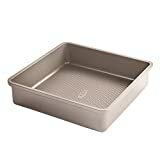 Line a 9x9 baking pan with parchment paper (for easier cleanup), and trim off any paper that extends past the upper edges of the pan. 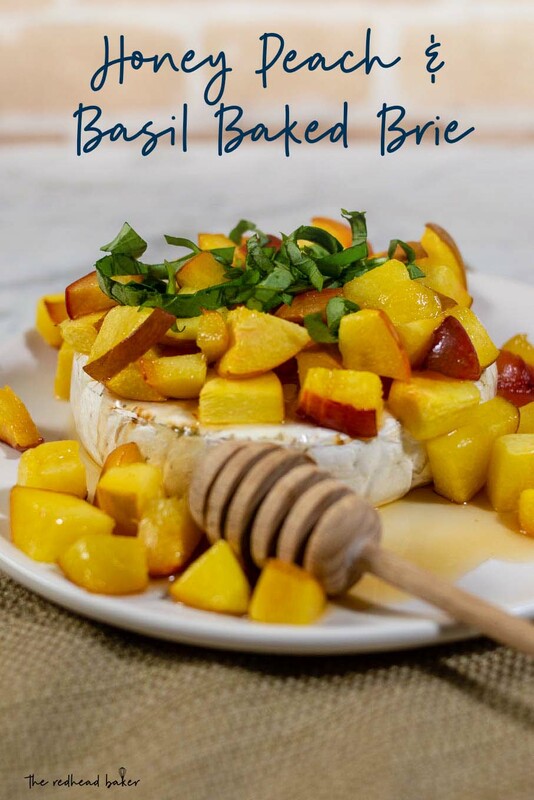 Place the brie in the center of the pan, and sprinkle the chopped peaches on and around the brie. Bake for 10 minutes. Switch the oven to the broil setting. 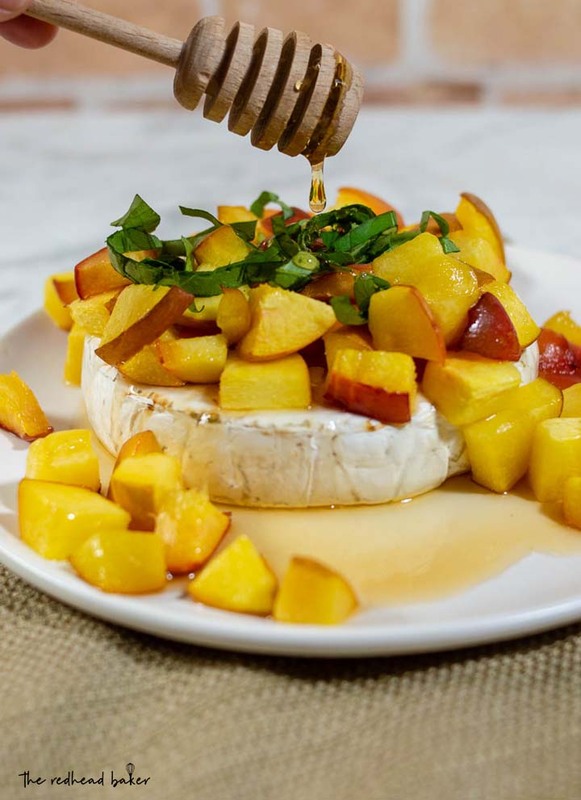 Drizzle the 3 tbsp of honey over the peaches and brie. Broil about 6 inches from the flame for 3 to 4 minutes, until the edges of the brie begin to turn light brown. 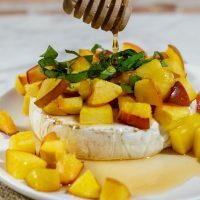 Use a spatula to transfer the brie to a serving plate, as well as any peaches left in the pan. Garnish with the basil, and drizzle on more honey, if desired. Serve with crackers. Love the flavor profile and I’m lucky enough to have an oven on my outdoor grill so this is perfect for me. This is incredible, and that hanging bit of honey is gorgeous. I love the fresh ingredients with the brie.